After reading the Magnus Chase series, I decided to completely switch genres and finally read a book series my mom lent me (that I knew she wanted back soon). I was hesitant to commit to the series because the first book is an 800 page whopper. I hate long books. Mostly because I feel like they're going to waste my time... as in I could read two, maybe three books in the time it'll take me to read one really long one. But I gave THE UNDAUNTED, by Gerald Lund, a try. Gerald Lund is a Mormon author. Everything I've read by him so far are Mormon or religious books- The Work & the Glory series is about the early members of the Mormon church, and The Kingdom and the Crown trilogy takes place during Jesus Christ's time. 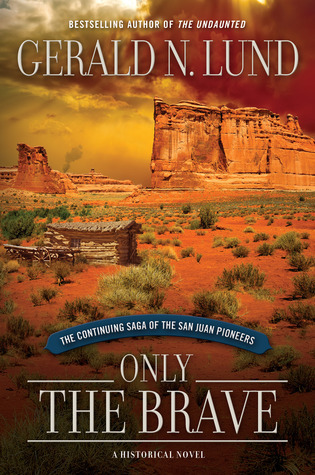 The Undaunted is the same, this time about pioneers in the late 1800s who were asked to settle the San Juan area. So here is my very contradictory opinion about The Undaunted. I was into it from start to finish. But it was too long. I mean, the first couple hundred pages were backstory basically. 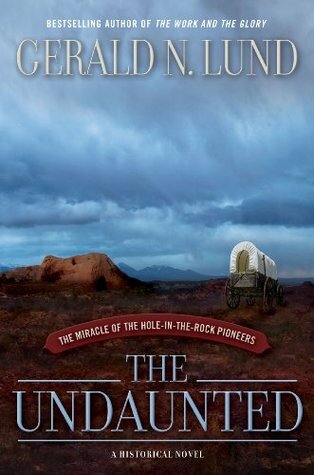 The story didn't get to the main premise (the pioneers going through the Hole in the Rock) until the last two hundred pages. I mean... it irks me when authors are allowed to get away with this kind of thing. I mean, why? At the same time, aside from a short section in the middle, I enjoyed every bit of it. But it still could've been shorter. The second and third books of this series, ONLY THE BRAVE and TO SOAR WITH EAGLES, introduce new characters. They're much shorter. BUT... here's where I really contradict myself. I just couldn't bring myself to care as much, and I think it's because these characters weren't developed enough. I didn't want another 800 page book, but I just wasn't as into their struggles because I didn't really know them. I gave THE UNDAUNTED 4 stars, and these other two 3 stars. Not the worst reads but not my favorite either. Now I'm totally in this slump. I started a contemp romance I had on my Kobo, but quit because I just wasn't into it and some of it was a bit ridiculous. I'm waiting on two books from my library, so I really don't know what to read. Right now, I'm debating between reading one of my kids shorter MG books, or rereading Anna and the French Kiss, a book I loved and have always wanted to reread. I'm thinking I'll go the latter because I hate being in a book slump and I think Anna will bring me out of it. What do you do when you're in a book slump?